Landing on the toundra, June 1983, Eastern Axel Heiberg Island. 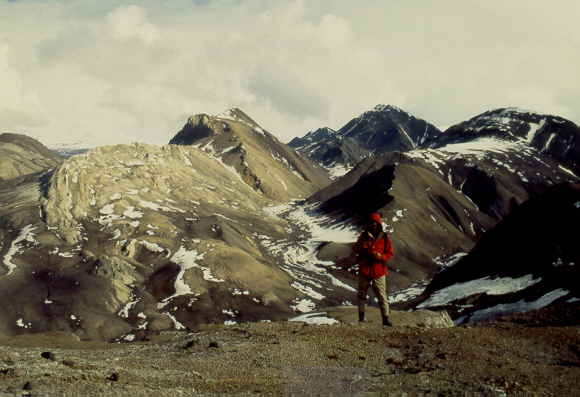 It is the start of a two month expedition on Northern Ellesmere Island . 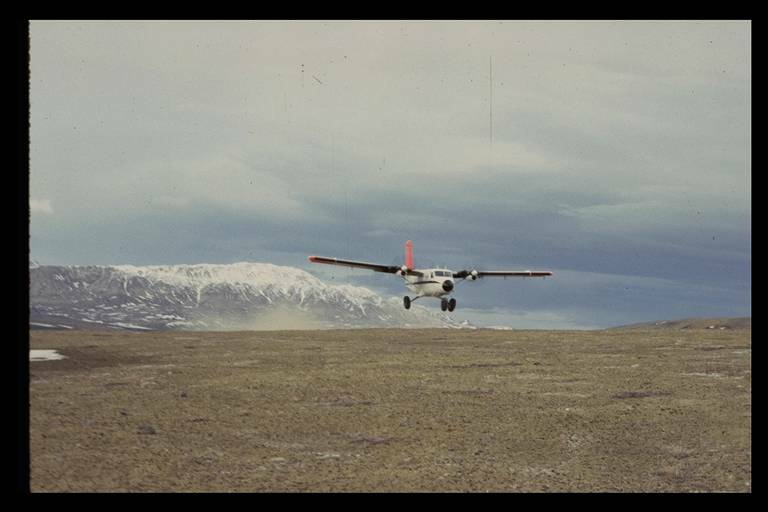 It seems the two pilots of our Twin Otter plan have a landing site in mind, they are pointing at a clear area in the partly snow covered valley between mountain ranges . I can't communicate with them more than a few words without a head phone, 'Yes, good spot, try it'. Two more loops, the plane suddenly drops, engines are slowed down, a sudden touch down, rocks hitting the big soft tires, propellers back at full speed in reverse to slow down the plane, the plane shaking in a roaring noise. Within 5 seconds the plane stops. We used a minimal runway, less than 100 m.
After unloading the plane, the pilots wish us good luck, ‘will pick you up in two months’. Bye, bye civilisation, welcome Arctic wilderness. Yesterday we left Toronto for Ellesmere Island on the Arctic Ocean. Toronto suffered from a mid June heat wave of 36 degrees Celsius. We traveled through Montreal and Iqualuit (Frobisher Bay) on Baffin Island to Resolute Bay on Cornwallis Island , some 4500 km. In Resolute Bay it was around freezing conditions and most of the island was still covered in snow. 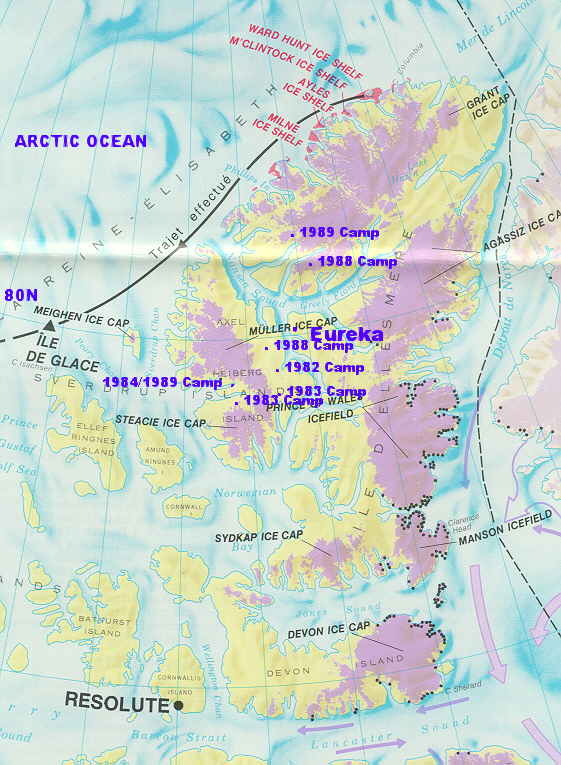 The sea straits were frozen solid and would not open up until August. The famous NW passage runs South of Resolute Bay and John Franklin, the leader of an ill-fated expedition from 1845 to 1847 is buried on near-by Devon Island. Like most of the other officers he died from eating lead poisoned canned food as cheap lead welds were used as seals. The low-ranked crew survived as they were not allowed to eat canned food but they perished later during the Arctic winter trying to make their way home through the Hudson Bay. After 3 hours flying, I can now see the camp site area I hand-picked from an arial photographs in the broad, rocky valley. There is still heavy snow cover, some 70%. I hope we can find a descent landing area, all we need is a 100 m flat area without big rocks and snow. Two more loops in the plane to check the landing site. The best sites are on gravel bars but I do not see any in the km wide braided river stream. If you have a weak, acid stomach by eating a breakfast of eggs and grape-fruit, you may be in trouble as the loops with its strong G-forces may turn over your stomach. It seems the two pilots have a landing site in mind, they are pointing at a spot and the engines are slowing down but I can't communicate with them more than a few words without a head phone, 'Yes, good spot, try it'. A sudden touch down, rocks hitting the big soft tires, propellers at full speed in reverse to slow down the plane, the plane shaking in a roaring noise. Within 5 seconds the plane stopped and used only a minimal runway, less than 100 m.
We get out, a fierce cold wind is blowing. We unload the equipment and food for 8 weeks. Two heavy, sturdy tents will be 'home' for the next two months. I check the two-way radio for the power and connection with the base in Resolute Bay, some 600 km South and locate the 12-gauge shotgun with ammunition. The dry Arctic wind is strong as usual and it must be around -2 Celsius. My hands are cold instantly. The pilots wish us good luck and the empty plane takes off within a 100 m. Bye, bye civilizations, welcome Arctic wilderness. I load the shotgun in a routine but we will not see a polar bear as we are 10 km from the sea and wolves never attack. Polar bears are rare in this area as seals, their favorite prey, are uncommon. We start setting up the camp in a hurry to get a shelter for the cold and strong wind. Two hours later we have the cooking stove going and heating the small kitchen tent. It will take another two weeks before our bodies will be acclimatized. I wonder how my student feels. It is his first time but the changes are very extreme, one minute you are in a comfortable plane, the next minute in a desolate wilderness consisting of rocks and snow only at freezing temperatures. You are visitor # since February, 2003. © 2003 www.treks.org. All Rights Reserved.